Two of the Evenflo’s convertible car seats that you may consider are Evenflo Triumph LX and Evenflo SureRide DLX. They are both introduced as 2-in-1 convertible car seats that you can use as rear-facing infant car seat then converted into forward-facing harness car seat. Which of them is the one that you should choose? To answer that question, we need to know the comparison between Evenflo Triumph LX and Evenflo SureRide DLX. Let’s talk about that on this article before We can decide which of them is the one that We should choose. What You Should Know about Evenflo Triumph LX? 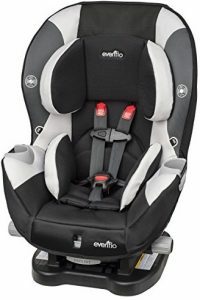 Evenflo Triumph LX comes as 2-in-1 convertible car seat that can be used as rear-facing infant car seat for 5-40 lbs infant or forward-facing harness car seat for 22-65 lbs toddler. Evenflo Triumph LX comes with 5-point infinite slide harness that easily slides to adjust for an accurate fit so that your child can be comfortable and secure while also easy to get in and out of the car seat. We can also find tension right adjusters and buckle pockets in Evenflo Triumph LX. Tension right adjusters help you to tighten the harness easily by turning the knob, while buckle pockets protects from buckle burn while keep the buckle easily found. Evenflo Triumph LX is also completed with e3 side impact protection that reduce side impact energy with its 3 layers of expanded layers of protection. We can also install Evenflo Triumph LX easily as It’s completed with Quick Connector latch system that help you install this car seat quickly on multiple vehicles. To keep your child protected as well as make them for comfortable, Evenflo Triumph LX is completed with energy absorbing foam liner. It’s also already side impact tested while It’s also federal crash tested. For smaller infant, Evenflo Triumph LX is completed with removable infant head and body pillow to keep them comfortable and secure. Evenflo Triumph LX is completed with dual integrated cup holders on both of its sides to help your child easily access their favorite drink during the trip. Evenflo Triumph LX also comes with machine washable seat pad that help you to easily clean it when It gets dirty. What You Should Know about Evenflo SureRide DLX? One of the popular affordable convertible car seats that We can find in the market is Evenflo SureRide DLX. It can be used as rear-facing car seat for 5-40 lbs infant then converted into forward-facing harness car seat for 22-65 lbs toddler. Evenflo SureRide DLX comes with 5-point front adjust harness that helps you to get your child in and out of the car seat easily. We can also find 6 harness positions combined with 2 crotch buckle positions that helps your growing child comfortable and properly fit. We can also find removable head and body support for your smaller infant so that they are comfortable and securely fit. Evenflo SureRide DLX is also completed with Energy Absorbing foam liner that provides additional safety layer for your child while also make your child more comfortable. Evenflo SureRide DLX also comes with 5-point upfront harness adjustment so that you can easily get your child in and out of the car seat. Evenflo SureRide DLX is side impact tested, while It’s also federal crash tested so that you can be sure that this car seat is safe and secure to be used by your child. There’s also cup holder that can be folded down and completely removable in Evenflo SureRide DLX to give your child easy access to their favorite drink. We can also find machine washable seat pad in Evenflo SureRide DLX that help you to clean this car seat easily when It becomes dirty because of usage. Before We talk about the comparison between Evenflo Triumph LX and Evenflo SureRide DLX, We need to know their specs and features. The specs and features of Evenflo Triumph LX and Evenflo SureRide DLX can be found on the table below. The specs and features of Evenflo Triumph LX and Evenflo SureRide DLX can be found on the table above. From those specs and features, We can talk more about comparison between those two convertible car seats. Let’s talk about that together. Evenflo Triumph LX and Evenflo SureRide DLX are both introduced as 2-in-1 convertible car seats that can be used as rear-facing infant car seat and forward-facing with harness car seat. Their recommended weight limit is also identical. They can be used as rear-facing infant car seat for 5-40 lbs infant then converted into forward-facing with harness car seat for 22-65 lbs toddler. Both of Evenflo Triumph LX and Evenflo SureRide DLX are already side impact tested and federal crash tested. They are both also completed with Energy absorbing foam liner to provide additional safety layer for your child while also improve your child’s comfort. While They both are already side impact tested, Evenflo Triumph LX is additionally completed with e3 side impact protection that can reduce the crash energy from its 3 layers of expanded zone protection. Evenflo Triumph LX comes with 5-point infinite slide harness, while Evenflo SureRide DLX comes with 5-point front adjust harness that combined with 6-positions adjustable harness. Infinite slide harness is more advanced harness system that help your child to easily fit with its harness since the harness easily slides for accurate fit, while 6-positions adjustable harness have more limited options for an accurate fit. Both of Evenflo Triumph LX and SureRide DLX also come with latch system so that It’s easy to install those two car seats. Additionally We can also find tension right adjusters and buckle pockets in Evenflo Triumph LX. Tension right adjusters is able to easily tighten the harness by turning the knob, while buckle pockets is able to prevent lost buckles under your child as well as prevent hot buckle burns. Both of Evenflo Triumph LX and Evenflo SureRide DLX come with cup holder, although their cup holders type is different. Evenflo Triumph LX comes with integrated dual cup holders, while Evenflo SureRide DLX comes with attached single cup holder. Both of Evenflo Triumph LX and SureRide DLX also come with machine washable seat pad, so that you can easily clean the two car seats when they become dirty. Evenflo Triumph LX is the model that positioned higher, that’s way Evenflo Triumph LX is commonly offered at the higher price than Evenflo SureRide DLX. But how much is their price difference? If you are interested to know the price difference between Evenflo Triumph LX and Evenflo SureRide DLX, you may need to check the latest price of those two convertible car seats since their price often change from time to time. Why Should You Consider Evenflo Triumph LX? 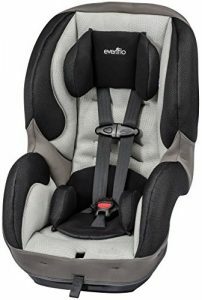 Share the post "Evenflo Triumph LX vs SureRide DLX Comparison"
If you are looking for car seat for your child and..
We can find Evenflo Maestro and Evenflo Tribute LX as two.. If you are looking for affordable convertible car seat, you can..